Now, while some may say “the golden age of antiques collecting is over,” in fact, it’s not over, and for some, it’s just beginning. There’s so much opportunity out there, especially for twenty- or thirty-somethings just starting out and setting up homes. Many members of this generation are unaware or uninterested in the antiques world, and often head straight to Pottery Barn, Restoration Hardware, or IKEA for copies of original items we see here at Skinner every day. Things don’t need to be this way. 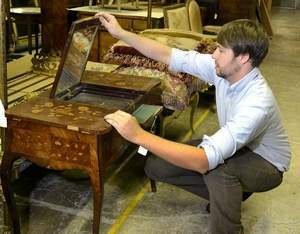 With a little information and effort, younger collectors can acquire affordable antique furnishings, and enjoy living with distinctive works of art and antiques instead of cookie-cutter, mass produced furniture. And they can see a solid return on their investments in the future. It’s a better investment to have a few really good pieces than dozens of mediocre ones. Even if you’re buying on a budget, you should keep this in mind. I’ve seen houses with large collections, but there’s nothing incredible or fantastic. Commonplace items, even those that are hundreds of years old, don’t really go anywhere in the marketplace, no matter how long you keep them. Beyond that, there’s an argument surrounding quality. When buying antiques at auction you can get solid wood furniture handmade by really gifted artisans for the same amount – or less – than at a brand name, mass-produced furniture store that often sports “distressed” finishes to mimic the character that comes with age and use. Much of the American antique furniture on the market today is an incredibly good buy. As you learn more, you can trade your early purchases for something of higher quality. Look for a better desk; sell the restored Chippendale. You might get your money back or even make a profit. Who knows! Don’t be afraid of looking at all the things you’ve collected and thinking about what you’ve learned since you bought them. We learn from our mistakes as well as our successes, and there’s no exception to collecting. Finally, don’t be afraid to play it slow when you start collecting. The best antique furniture is both beautiful and practical; it takes time to learn what you want and can use. Museums, antique shows, and auction previews are great places to learn.